We have a unique combination of technology with LNG analysts and pricing experts. They deliver LNG trade data, news and cargo movements as well as hard to obtain prices on our online platform LNG Edge. Our speed of delivery and round-the-clock market coverage are only possible thanks to our 24-hour direct contact with LNG trading and shipping professionals from our global offices. The ICIS LNG Supply Forecast is a two-year online global LNG supply forecast with monthly granularity. It is powered by comprehensive volume, plant outage, infrastructure and contract datasets. Why choose ICIS LNG solution? See LNG companies’ long-term contracts and short-term trade data on the LNG Edge company pages. The interactive contract balance tool gives you quick visualisation of the complex landscape by company. Our analysts keep deals and contract data updated through continuous research. You can also see contract balance on a country level. Alternatively, download the contracts data in Excel if you need the detail or want to build your own views. Unlike other vessel tracking only websites, LNG Edge tells you not just where a vessel is, but what’s on board and in most cases, whether the cargo is a spot, mid or long-term trade, who bought and sold it and where available, the price. As well as the usual AIS messages which can sometimes predict destination, the ICIS service integrates other types of evidence to give a much better prediction rate: Intelligence from our global network, automated integration of the world’s port schedules and a finely tuned algorithm. Usability is always key – the whole fleet can be viewed and filtered on a map. You also pick out a few vessels and locations of interest and set up your own Watchlists. The global infrastructure tool is not just a list of available production and import infrastructure; it uses the experience of the ICIS global analyst team to filter all the noise around project announcements and delays. What you get is the realistic view of future infrastructure availability, bang up to date through the monitoring of our global reporters and filtered using the judgement of our analysts. Plant performance data is real-time, so no need to analyse customs data or wait for consultants reports, because it integrates the Edge cargo tracking capability for all import and export infrastructure. The ICIS LNG solution incorporates real-time news, daily price assessments for all DES and FOB locations plus European trading hubs, trade data, contract prices, charter rates and more. News and pricing are generated by a global team of editors from the ICIS publishing division that was the first to assess the global LNG trade. There is a long history of commercial data for Edge customers to chart or download. Let our team of reporters and analysts do the legwork for you on gathering tender open, close and award data, including prices. Turn on alerts if you need instant information, use our news service, archive or historical data table for ad hoc analysis. Our team does the same for future LNG plant outages and maintenance. 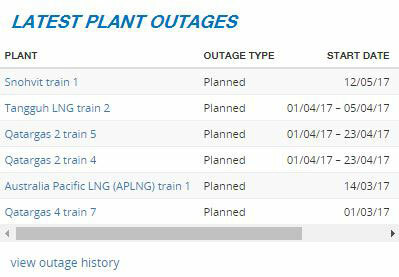 The Edge plant outage database contains all outages plus reasons with a 5-year history, as well as the volumes lost each time, to support your forecast models. Get direct contact with the ICIS LNG experts through our Live Chat service when you are an LNG Edge customer. We’ve built a reputation for responsiveness and expertise which benefits both you and us, as we continually add to and improve our LNG services. Our team includes ICIS analysts who provide impact analysis and longer-term outlook/forward-looking view and editorial experts who produce a shorter-term outlook for LNG spot trading markets co-operate with each other to provide coherent analysis.